The Radial Bones Twin-City is an active ABY switcher and buffer that enables you to connect any two amps and drive them simultaneously without noise, loss of gain and without degrading your natural guitar tone. This is accomplished with Radial's highly acclaimed buffering technology and the same Drag Control (TM) load correction circuitry as used in the award-winning Radial JD7 Injector. 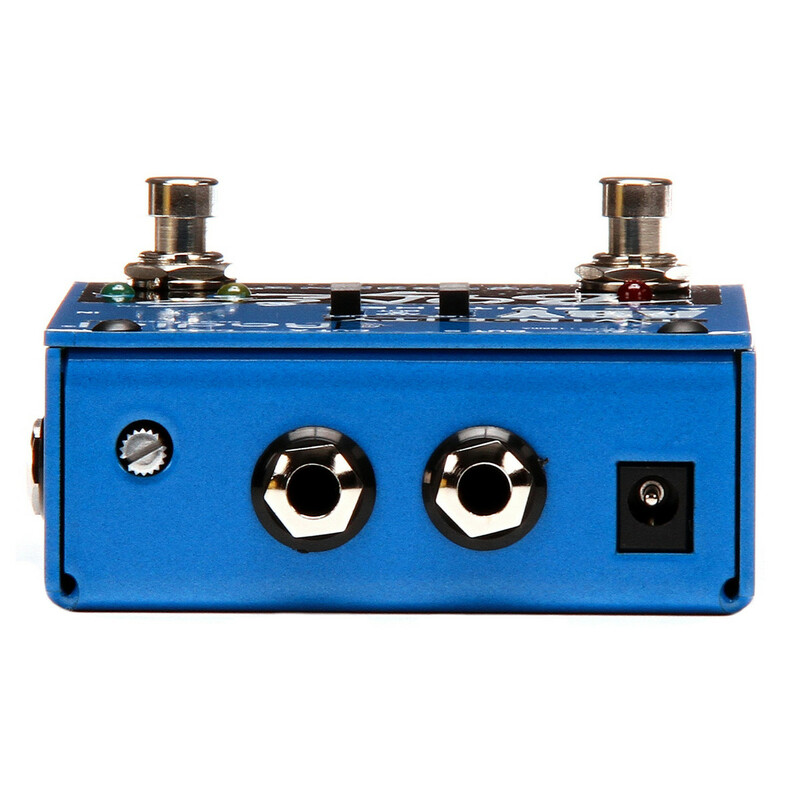 The 'set and' forget Drag Control lets you compensate for cable signal loss and introduce the perfect amount of loading to replicate the way your guitar and amp interact. To eliminate hum and buzz from ground loops, the Twin-City is equipped with an isolation transformer on output B. 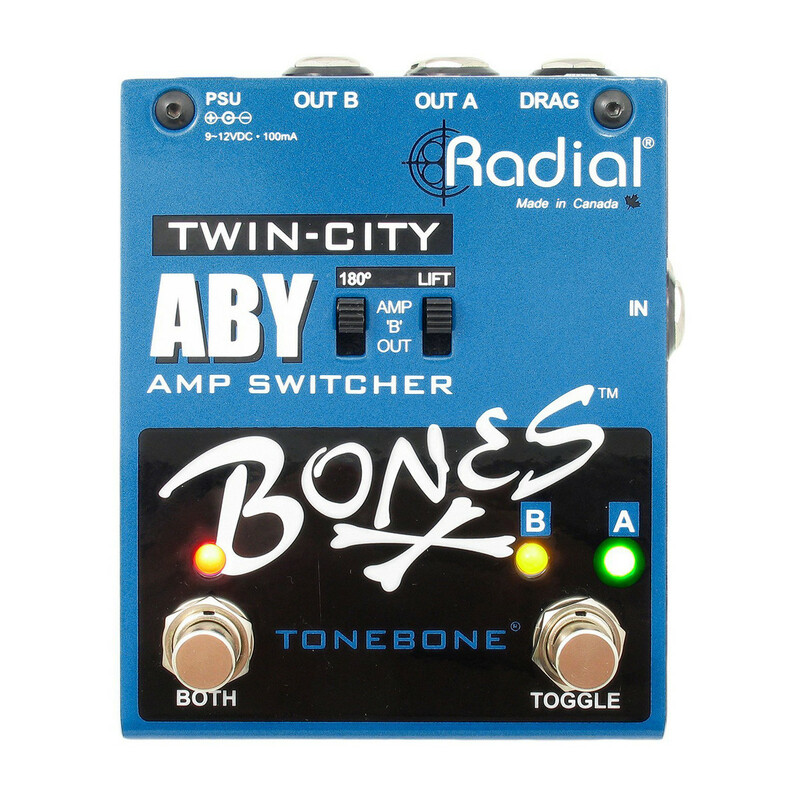 This is augmented with a ground lift switch and 180º polarity reverse switch that ensures both amplifiers play in phase while noise is reduced to an absolute minimum even when using older vintage amps that are generally more prone to noise. 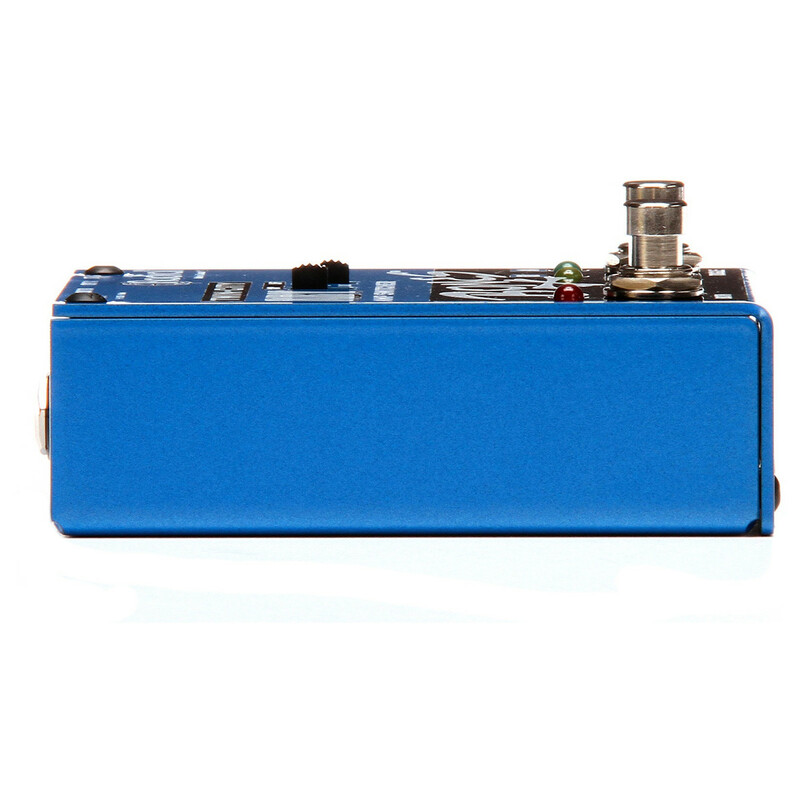 As a buffer, the Twin-City lowers the impedance and susceptibility to noise, making it the ideal signal driver for large stages when using long cable runs. Like all Radial products, the Bones are constructed from heavy 14 gauge steel for greater durability and added 'stay put' when kicked around on a busy stage. For even greater durability, the Twin-City employs our latest EIS - Electronic Impulse Switching - for unmatched performance without the challenges posed by mechanical switches. Bright, easy to see LEDs deliver on-stage switching cues so you know exactly where you are at all times. 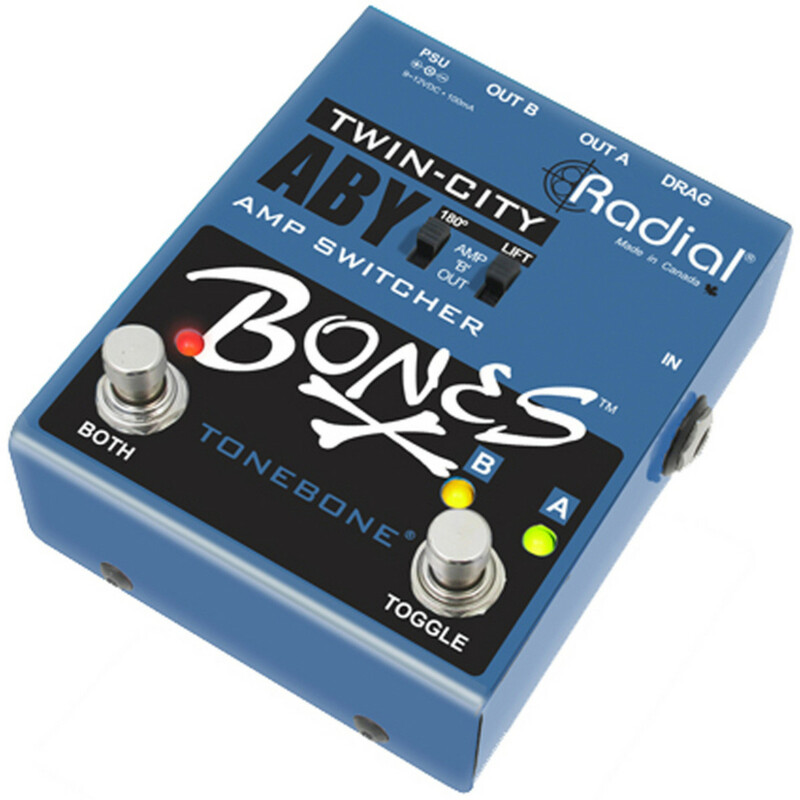 As most players employ pedalboards, the Twin-City features standard 'Boss style' 9V powering that will adapt to most multi-pedal power supplies. 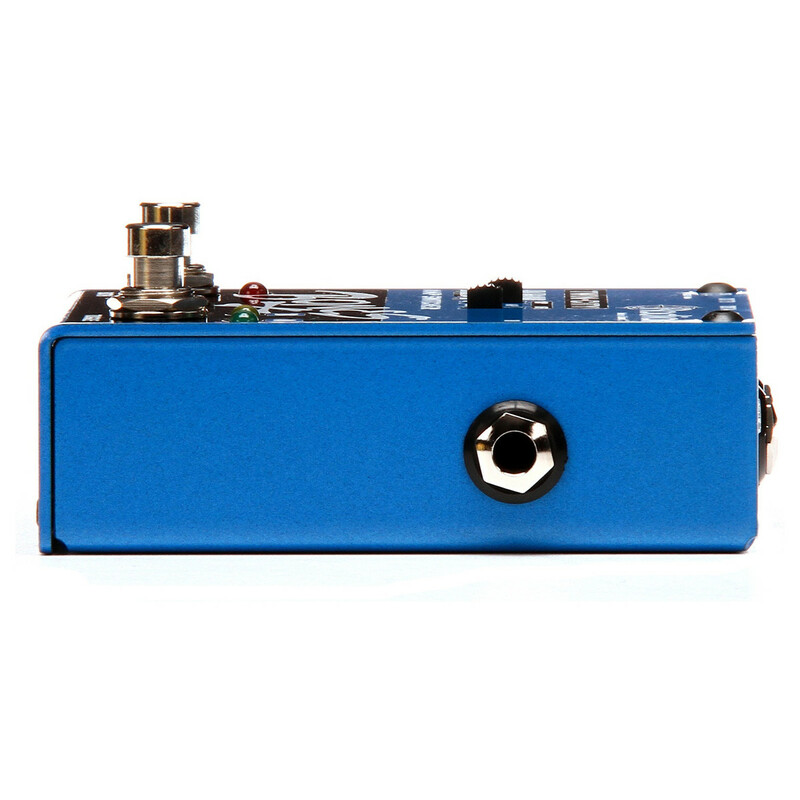 The ultra compact design with top mounted output and DC connections allow pedals to be placed close together for those wishing maximum pedalboard density. 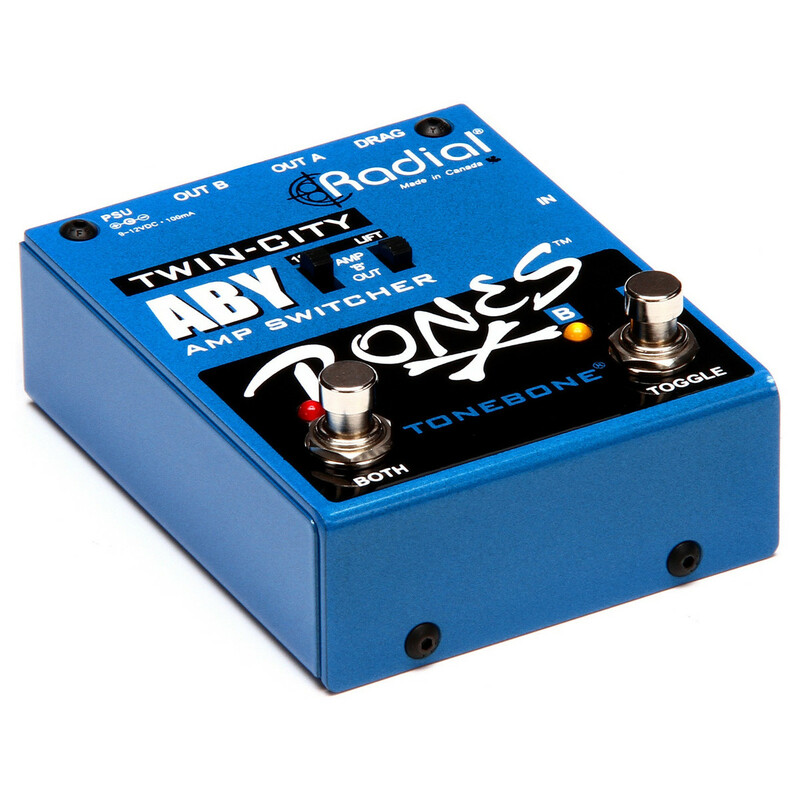 The Twin-City is a powerful ABY switcher that delivers all of the natural tone, punch and clarity of a true-bypass device without the popping noise of mechanical switches or the induced hum and buzz caused by ground loops.